The thought of traveling overseas as an adult can create anxiety. Add kids to those travel plans and you’re talking about a whole new ballgame. Fortunately, it can be done, and you don’t need to hold off on those exciting adventures until your kiddos are older. A little planning and you’ll be making memories in no time. In general, passports and visas take 10 – 12 weeks to process. Be sure to double-check expiration dates on your current passports to make sure they won’t be expiring within 6 months of your planned trip, or you could find yourself stuck on “Go.” Note that some countries are even stricter, so check out a travel website to get up-to-date information regarding your particular destination(s). If your timeframe is compressed, expedited paperwork can be done, but it will cost you much more and can be stressful. If only one parent is traveling, additional paperwork will be needed. Again, be sure to consult both U.S. requirements and those of your destination(s). Make a copy of your passports and visas and keep them with you, leaving your originals in your hotel room safe. I also have scanned copies that I emailed myself for ready access on my phone (though be careful to password protect your phone in case you lose it or it’s stolen). Check your destination for any immunization requirements and make sure yours and your children’s are in order. Notify your credit card companies prior to departing so they don’t deny your overseas charges on the suspicion that some Russian hacker has stolen your information. And it’s a good idea to take more than one card with you. When possible, book an evening flight. Entertaining kids for 6+ hours can be difficult, so having a nice long stretch of sleep will help. 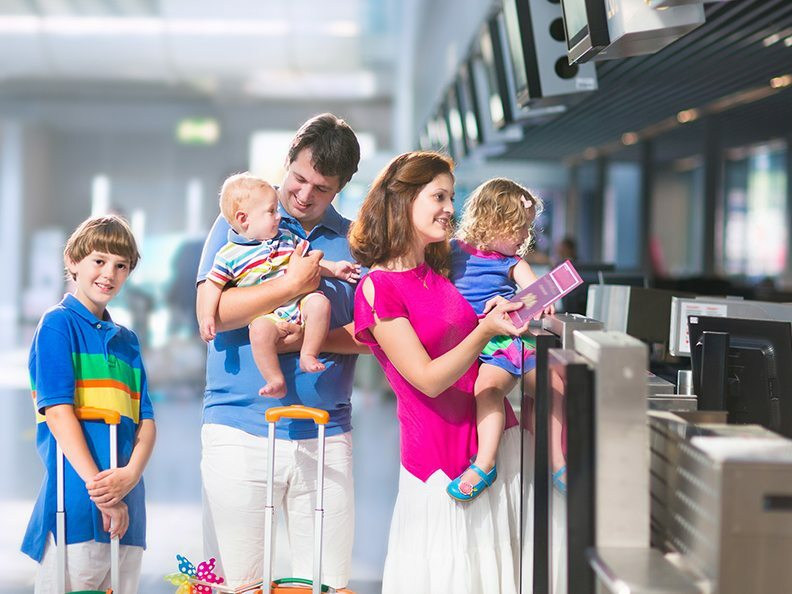 Return flights may be harder, so prepare to have new things for the kids to do. In the past, I’ve created small “surprise bags;” just simple brown paper bags into which I put small games, crafts and toys. Each hour, the kids (if they were well behaved) got to pick a new bag with a different surprise. If you are traveling with an infant, many larger jets have bassinets that can be placed in the bulkhead seats of the plane, giving your little one an easy place to sleep. Toddlers may need car seats, so please check with your airline for allowed sizes and types. Be prepared for jetlag. No matter how tired you are upon arrival, do your best to force your body to get on the new time zone. Push to stay up as long as possible by engaging in stimulating and exciting events appropriate for you and the kids to help with the transition. Put enough clothes and toiletries for 1 – 2 nights in your carry on. Lost luggage happens. And if traveling with small kids, accidents happen and you’ll definitely want clean clothes for yourself! Don’t line up too early! Getting on the plane or train early means more time you are going to have to keep your kids busy. Wait until the last call! Be flexible. Having a schedule and agenda is helpful, but being flexible will lead you on much more exciting and less stressful adventures. Utilize the concierge. Concierges have great recommendations and work to make sure you have fun. Pack less! Lugging kids and luggage around can be difficult. The convenience of space we have in the States doesn’t exist in most of the rest of the world. Expect smaller cars, smaller rooms, smaller EVERYTHING. Be safe. Again, consult the concierge to learn about any safety concerns in the area. Have an emergency plan in the event of a disaster or someone getting lost. Talk with your kids about busy areas and the importance of staying close to you. Upload pictures regularly. I utilize online photo storage so that losing my phone or camera won’t mean losing all of those valuable memories. Smile and have fun. New things can be intimidating and not knowing the language can be challenging, so download apps to help you. I love the Google Translate app. You can take pictures of a menu or other signs for immediate translations. It also has a microphone feature that provides audio translation, as well. GENIUS! Most important, ENJOY it! If you plan and get your mind right ahead of travel day, you CAN enjoy the journey; see the trip through your children’s eyes and focus on the memories you’re giving them. It’s an amazing world, so explore, ask questions and have fun! Start to grow your network by reconnecting. Yep, I’m going to say it – Facebook! Nearly half of all internet users have a Facebook account, so you are likely to reconnect with childhood friends, high school and college friends, past co-workers, neighbors, the list goes on forever. The friends you haven’t kept up with are likely to be more valuable than your current contacts. Every reconnection leads to the question, “So what are you up to?” As you reconnect – always private message a quick hello, “Thank you for accepting my friend request, I have been thinking about you and wondered what you are up to these days.” Make it about them first, eventually they will ask about you. Find kid-friendly events/activities and attend! Local fairs, parks, expos, health fairs, indoor play gyms, library events, Michael’s craft events, Home Depot and Lowes Kids DIY activities, etc. Many of these events/activities are low-cost or free. I usually try to arrive 10 minutes early so I can greet other mom’s as they are arriving and checking in, scouting out who I would like to get to know more. As the kids get involved in the activity, I sit near the person I have determined I want to get to know. Sometimes I will even have an extra bottle of water and snack bar that I can offer, so we can strike up a conversation. If the conversation and interaction goes well, instead of offering up a business card to keep in touch, I ask if we can connect on Facebook, because it’s totally non-threatening and normal to do so these days. Offer to chaperone school field trips, help with class parties, volunteer in your child’s class and help with school carnivals, as you’re always likely to meet a few parents you didn’t previously know. Look for a paint night, cooking class or the latest trend “plantnite” (where you enjoy social time and make beautiful succulent arrangements). Arrive early and work the room, so you can sit next to someone with whom you made an authentic connection. You never know to whom your next connection might lead; each connection has the potential to introduce you to your best client yet. If you are looking to expand your network, make it known to others. Think about the Facebook friends you have added over the years. Of course you might be annoyed with some of their crazy cat videos or political rants, but one of these people could be the connection between you and your next client. The people you are closest to generally want to help you, but it might be the people you do not speak with on a regular basis who will take to your messaging. Before you send out a mass Facebook message or a tacky status post, consider a more strategic approach. People are more likely to refer others to you if you have set parameters as to the types of people with whom you generally (or would like to) work. And be as specific as possible; by giving your contacts specific keywords, they can refer you to those who match your criteria. For example, instead of a status post like “Hey friends, I’m looking to network with a marketing professional, do you know anyone?”, try a personalized private message like “Hi Mary, I’m looking to network with a marketing professional who has retail experience, I thought of you because as an HR professional, you may have someone in your network who you could connect me with. I’d really appreciate any thoughts you might have.” The worst that can happen is they ignore or unfriend you, but they could hold the golden ticket to add to your network. Volunteering in your community or with organizations that you are passionate about is a great way to meet new people. And the plus-side is that you go into it knowing that you share common interests. It’s no secret that for most of us, exercising can often feel like a chore or even a bore, but thankfully there are some workouts that both help you get your blood pumping and are extremely fun! Not only will you feel better physically, but it’s a great way to meet people. Check out Thriller Dance Classes, Pound Drumming classes, Modern Yoga, Barre Classes, Orange Theory, Spinning, or classes at your local gym. 8) Do you enjoy politics? Attend your local City Council meetings or School Board Meetings. As with anything, in order to make true connections, you have to be consistent and attend these meetings on a regular basis. If you only go occasionally, you aren’t likely to make true connections. The MeetUp app is a great way to find local networking events, but the key to networking means you actually have to talk to people you do not know. As you consider attending a networking group, do your research and find out who the target audience is and whether it matches what you’re looking for? You may need to attend a few different groups to find the right fit. And make sure you have time for the group (i.e. if you’re limited on time, look for a group that meets monthly instead of weekly). When you find the right fit, commit to being an active member. Be interested versus trying to be interesting. In order to make a connection, you can’t do all the talking, you need to be interested in the other members and ask them questions and really listen. If their answers indicate they’d be a good fit for your business and you think you’d enjoy working with them, cultivate a relationship. 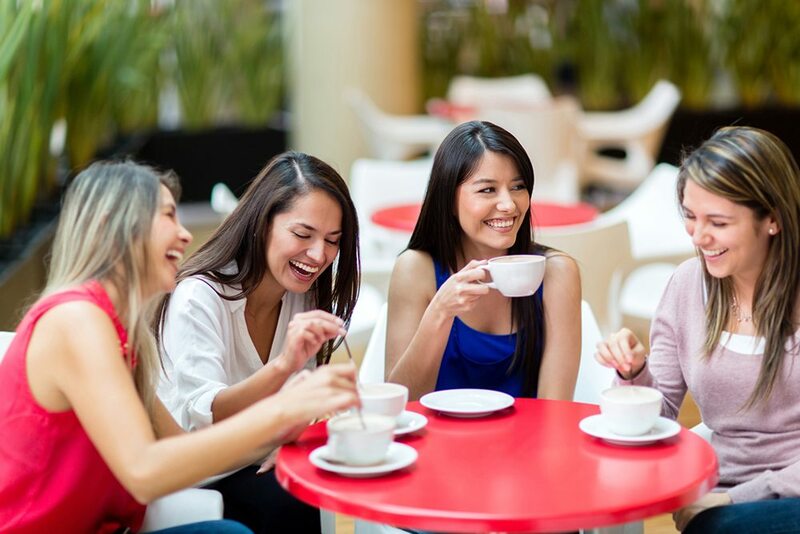 Don’t just pounce on people with your business, simply use the time to connect and then invite them to coffee or lunch to connect further at a later date. Remember, this is an investment of your time over time (i.e. a marathon, not a sprint). With modern technology such as MeetUp or Facebook, it really is easy to create your own event. Be specific about who you are trying to attract. Find an inexpensive venue with both a pleasant/comfortable ambiance and ample parking. Be clear about the cost to attend the event. Have an agenda and stick to the time allotted. It’s important that the first event goes smoothly, so you’re your attendees will not only come to your next event, they’ll bring guests, too. I understand that all of this can be very intimidating, but to get started you must practice, practice, practice, and as you practice you’ll get more comfortable. Make networking a natural part of your day. Before owning my own business, I was quick to get in and out of places, whereas now I tend to go to places like the grocery store and carwash at the busiest times of the day (e.g. to catch those part of the lunch hour rush or the 5:00 pm after work crowd). I challenge myself to strike up conversations with random strangers everywhere I go and be the nicest person they have met that day. It’s important to be visible and build strong, lasting relationships with those people you add to your network. Doing so will enhance your credibility and land you those coveted referrals. Then one day, I woke up and decided I needed to challenge myself. A group of co-workers and I decided to tackle a Spartan Race. 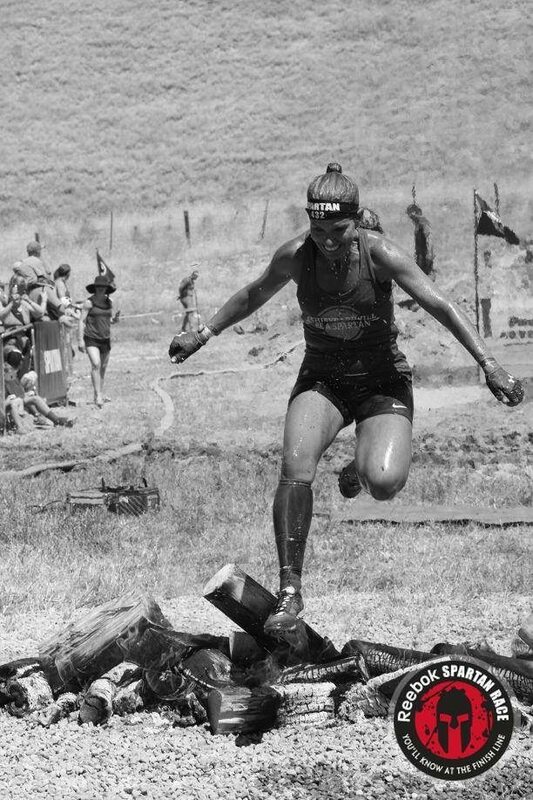 Spartan races can vary from 3-15 miles with 20+ obstacles testing endurance, physical strength and (especially for the beginner) mental strength. Our particular race was 5 months away at that point, giving me a good amount of time to train. The things I learned during this process really apply to anything in life. The biggest part of training is creating a routine so your brain knows exactly what to do even when stress or other factors come into play. I trained hard for this race. Never having done anything like it, I was truly nervous. Anxiety and fear crept in the week before the race. But the day of the race, I felt I was ready. I trained and worked for it. I learned to climb ropes, carry ridiculously heavy objects and pull sleds with massive weights, NONE of which I’d ever done before. When I was up against an obstacle that wasn’t exactly what I’d trained for, my body was up to the task because I’d trained my muscles well. Oh, and I’m including my brain in the definition of my “muscles.” Creating habits and a routine allows you to stay focused even when other stress factors are in play. And then I slammed into it…over and over again. I have huge bruises on my ribs from slamming into it. I couldn’t get the height I needed to push myself up. I couldn’t get over that dang hurdle. I tried, and failed repeatedly. I felt tears welling up. It was the first obstacle and I couldn’t complete it on my own. The team cheered me on and let me try over and over again. Finally, I accepted the help. I let a friend give me his knee and give me the boost I needed to get over it. My ego was shot, as I had wanted to overcome those obstacles on my own; I mean, I had been training for this! I could have quit right then. I could have let my head take over; the negative thoughts were strong. But I knew that as in life, we have a choice; a choice to pick ourselves up, swallow our pride, recognize that we need help sometimes, put on our game face and put one foot in front of the other and carry on. And it didn’t hurt that I nailed the next several obstacles climbing over walls. Working with others is so incredibly rewarding. It’s always amazing to watch how much more excited and fulfilled we are when we achieve things together. The success is stronger and more exhilarating. Our team had different strengths and, therefore, certain obstacles were easier for some than others. Having your team there to support you gives you that help when you need it, but also affords you the opportunity to pick someone else up when they need you. 4. Anyone can do it! Seriously. You may go slowly, you may cry, but you can do it. I watched people cross that finish line who I never would have thought would even consider a Spartan Race. That, in itself, was so inspiring! Pick your dream, identify your goal and work for it. “Can’t” is just a word, not a reality. 5. Our mental game is so key. If you want ANYTHING in life, you have to make the choice to get over those inevitable hurdles…and the good things usually have really big hurdles! The challenges can be overwhelming. You will question why it’s so hard. You will want to give up, go the easy route. You will think you can’t do it, but you’ll be wrong. You can. You truly can. When the noise creeps in, focus ONLY on the training and the activity that will allow you to achieve your goal. Just take it one step at a time, one foot in front of the other. YOU CAN, TOO! GO ATTACK THAT HURDLE, DANG IT! You may or May not be a sports fan. You may or may not be a football fan, but you would have to be living in a hole not to know who Peyton Manning is, and what significant event happened today. You can call me different than many women. I grew up in sports. I now have only sons and our lives revolve around sports. I would not wish to have it any other way. I watched a man today cry his eyes out thanking the world for the career of a lifetime. I cried right along side him, by the way. I’ve been lucky enough to meet a lot of professional athletes in my lifetime (including Peyton) – but I can tell you after the heartfelt speech that Peyton delivered today – I would be STAR STRUCK to meet him again. Not because of his stats of an incredible hall of fame career, but because of the man he is. Because of the role model of who little boys and young men should strive to be – OFF the field. Father, brother, husband, son, friend, teammate, leader, ambassador to the community – he excelled at all. There are so many lessons in this statement. He led from the front. He never asked his teammates to do anything that he also did not do first. He led with integrity, high standards, incredible determination and a no quit attitude. Everyone can learn from these attributes and apply to anything in life. 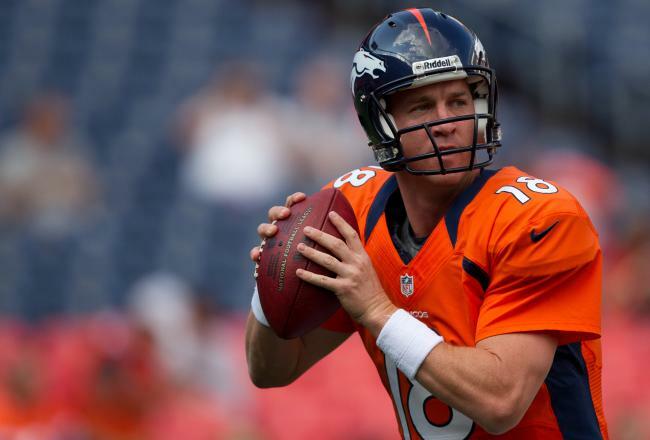 At the end of the day – Peyton over prepared – he was ready for anything that was going to be thrown at him , even adversity, injuries, critics, business politics, the media. But he never gave up. Peyton retired today after 18 years. He retired on top, with another championship. He’s leaving on his terms – no one else’s – the great people get to decide that. It brings me to another thought. Training for football is what this man has been raised to do. So what now? So get out there and find your passion – I know #18 will. He concluded with a final thought. A scripture reading 2Timothy 4:7: “I have fought the good fight and I have finished the race. I have kept the faith,” I have fought the good fight. It’s time. So I ask you this – what are you passionate about? Go find it. Because when you combine passion with a career – it’s a gift. NO one can take a gift away. I thank Moms Making Six Figures every day for giving me a gift no one can ever take from me. Cover electrical outlets. 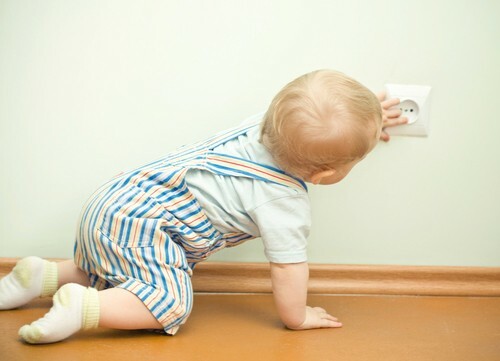 Plastic electrical covers are a cheap and easy way to protect small children from harm. Place fragile items and valuables up high. If it’s shiny, colorful, expensive, or made of glass, chances are little hands will want to touch it. Make sure it stays in one piece by placing it on a high shelf or putting it away until your guests leave. Get in touch with your inner child. Think back to when you were a child and look around your home. Which items would you most like to play with? Move the trinkets or rare books from the lower bookshelves, remove any possible choking hazards and put child locks on the lower kitchen cabinets to ensure that nothing gets broken or misplaced. Get down to their level. Children are small, so crouch downto their height and travel around your house, looking for areas where they may trip, hit their heads or possibly poke an eye out. If possible, purchase rubber bumpers from the store and place them on your furniture, move potentially dangerous furniture or warn the parents ahead of time. Think ahead. Slipcovers over your chairs and sofa are easy to was should they get dirty. Placemats on your end tables or coffee table can protect the wood from scratching. Talk to the parents ahead of time. If you have rules you’d like the children to abide by, tell the parents before they visit. That way they can prepare their children and enforce your rules. What Is Fact vs Fiction On The Internet? Harmful amounts of lead in lipstick, flesh-eating banana peels, toxic tampons. These things may sound outrageous, but claims of their mass distribution can be found on the Internet. So it must be true, right? Thanks to the advent of the World Wide Web, we have a wealth of information at our fingertips. Unfortunately, not all of it is true. Since anyone can post virtually anything online, there is an abundance of misleading, incomplete and inaccurate information circulating social media and even the most respectable sites. The more shocking stories tend to go viral, enticing throngs of readers to fall victim to false claims. The most convincing emails, posts and articles pair emotion-inducing intrigue with trusted testimonials or scientific-sounding specifics (bet you can’t say that fi ve times fast). So how do we sort fact from fiction? 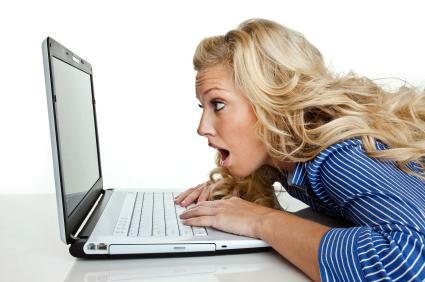 The first step to determining the veracity of online content is to simply become a skeptic. In other words: Don’t believe everything you read. Sounds like common sense, but no matter how witty or educated you are, you’ve more than likely been duped by a link that’s appeared on your Facebook News Feed because it was posted by someone you trust. To identify questionable content, there are a few red flags that should catch your attention, no matter where the story appears. 1. Excessive exclamation points. Hoaxes are designed to have a strong emotional element. Nothing encourages the spreading of a rumor more than outrage or excitement. Be wary of copy that relies on all-caps, hyperbole or exaggerated punctuation, rather than word choice and facts, to emphasize an idea. 2. An anonymous author. Without a credible, verifiable source, any reported “facts” should be treated with suspicion. If you can’t validate the information by checking multiple (at least three) reliable materials or making a phone call, it’s likely not been tested and proven. 3. Antagonistic claims. Beware of content that relies heavily on encouraging distrust in respected establishments or professions. Take, for instance, an article that suggests that doctors discourage the use of weight-loss pills to keep you unhealthy, thus ensuring repeat office visits. Instead of proving the safety of the pills, they hope to discredit the experts so you’ll purchase their product. 4. Too many testimonials. There’s no way to substantiate support or opposition by others if it’s not backed by scientific or measurable terms and recorded in a reputable publication. Journalists and scientists typically report their methods and procedures for acquiring data in detail so that peers can verify it. When a story relies heavily on hearsay, maintain a healthy sense of doubt. 5. Misspelled messages. Even the best editors have let a few spelling errors slip into print. But, for the most part, credible stories won’t have multiple mistakes. They will have been carefully combed to ensure quality content. 6. Self-promotional language. Anything that insists that it’s not a hoax or urges you to forward the content should be handled with caution. Methinks it doth protest too much. • Who sponsors or authors the site/article? Are they experts accredited by reputable institutions? Do they directly profit when people trust their message? Are their credentials legitimate? • Can you determine the primary source of the content? How easily? • Are there links to a journal, website or resource that could be searched for more background information? Do these links check out and support the claims? • Does data have more than one interpretation? Does the math add up? Do statistics lean heavily in one direction or can they be explained by multiple factors? • Is there any affiliation to an organization? How is the content supported (donations, grants)? • Can you easily contact the organization to check on the content? • When was the information updated? If it’s a website, how frequently is it updated? Don’t be coaxed by a hoax. If you don’t have time to fact-check every message, there are several reputable websites devoted to de-bunking rumors, including snopes, truthorfiction, hoax-slayer and factcheck.org. Many of these sites list their sources so that readers can verify the validity of their information. Once you have the facts, it’s up to you to decide what’s share-worthy and what should get the shaft. But don’t take my word for it. Check it out yourself.